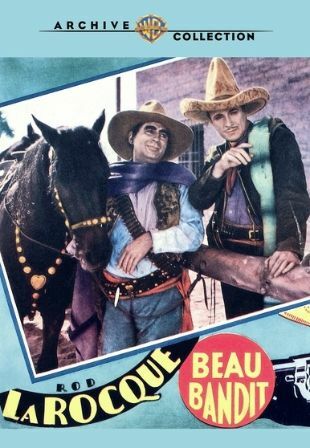 Latin Lover Rod LaRocque starred as a Mexican Robin Hood in this tepid Western melodrama directed by Lambert Hillyer. With a price on his head, LaRocque's gay desperado comes to the assistance of a fair damsel-in-distress (Doris Kenyon), who is suffering unwanted attention from unscrupulous banker Charles Middleton. Kenyon, however, loves poor but honorable George Duryea and the banker offers LaRocque $1,250 to kill the kid. "The story of the Robin Hood variety of lawbreakers has been told so often that one has a right to expect a better version of the tale," the New York Times complained. Villain Middleton, of course, later played the quintessential serial villain, Ming the Merciless, in the Flash Gordon cliffhangers from Universal. Juvenile lead George Duryea changed his name to Tom Keene and enjoyed some success as a B-Western lead. He later played villains as Richard Powers.